Inside of the buildings is where you will spend a majority of the game, attempting to wire up every story so that each apartment is turned on. On either side of each floor are a ladder structure that you can use to travel from one floor to another, and two hot wires. To completely wire up a floor, you must connect a line from one hot wire to the other, and completely connect any ceiling or floor input that a story contains. Once a story is completely wired, the floor below will light up. When this happens there is a chance that the floor will contain a TV set. If it does, a TV with legs will climb down to the floor below and walk to the left. If you can collect this walking TV before it disappears, you will be given an extra life. Some stories contain multiple apartments separated by gaps. These gaps must be jumped over of the Electrician will fall through them. Each gap also contains an electrical bridge that must be properly wired to complete the story. Sparks can travel along these bridges and present the most danger to the Electrician if he is standing on these locations. While you attempt to wire up each story, pests will be roaming around the building, making life more difficult for you. Three instances of Snakes, Mice, or Spiders will occupy the building at any given moment. Stories which are only partially wired are susceptible to having the wires going into the ceiling cut by pests. If a pest cuts a wire, you will be required to repair the connection before the entire story can be lit up. If a pest wanders into a live wire, they will become electrocuted and immediately replaced. Because of the way the screen scrolls, one individual pest will occupy a particular floor, and every fourth floor above and below. This is important to realize when attempting to clear out pests from a particular story. If you are working on one story that contains too many pests, and another story four flights above or below is complete, you can navigate to that floor and wipe out the pests, and then return to the original floor where you will find the story (hopefully) clear of pests. Your score is displayed at the top of the screen as a series of electric meters. The battery power displayed below the score is a remainder bonus that you will be awarded with if you complete wiring a building before the batter power runs out completely. Once a building is completely wired with electricity, you will be able to escape the building by climbing down to the lower left corner of the building and collecting a key. The number next to the key at the top of the screen indicates which building you must enter and wire next, which may include any building between 2 and 8. Once you completely wire your eighth building and escape, the game is completed. The Famicom version is considerably easier. The story connections are simplified and far more standardized between stories. They don't throw nearly as many pests at you at one time. There are much fewer bats, and the pests are distributed more evenly throughout the buidling, reducing the number of times you will be required to reconnect wires that they've eaten through. Before you begin each building (and each sewer level) you will be presented with the opportunity to set the speed of the level. If you choose low, the pests will move at a slow rate which, while making them easier to avoid, makes them take longer to get off the story that you'd like to complete. If you choose high, the pests move much more quickly, but they are harder to dodge as a result. Instead of a walking TV set, illuminating a floor may chase out a burglar. Like the TV set, you can climb down and capture the burglar, but doing so will reveal one of three items; a thumbtack, a helmet, or a bell. The bell will grant you an extra life. The thumbtack is actually a dangerous items and should be avoided. Ordinarily, the Electrician can jump through the floors of the stories above him with no ill effects. The thumbtack makes the Electrician extremely sensitive to the slightest bump with a floor, and makes progress in the game extremely difficult. The third object, the helmet, will remove this effect (as will dying). 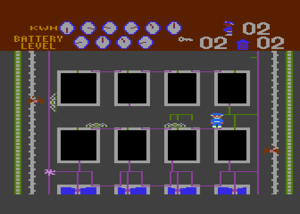 Sparks tend to originate from the right side of the screen, as opposed to the left which is more common in the Atari version. Also, the escape from the building is presented as a door in the bottom right corner of the building as opposed to a key in the bottom left corner of the building. Once you have finished wiring a building and collected the key to the next building, you must navigate your way to the next building through the underground sewers. Sewers are composed of three dark levels and a lower water level. Throughout each of the dark levels, you will find ladders that cross between levels, and invisible brick walls which can only be seen if you stand close enough to them with a flashlight. The brick walls cannot be passed by any means, so you must find an alternate route. The lowest level contains water, and a canoe that floats back and forth to the left and the right. You can ride the canoe and use it to bypass certain blocked off paths. Along the way, you may find another ladder to escape from, or a brick wall which will shove you off the canoe. There are red pipes that line the lower level that you can jump up to and hang on from if you must wait for the canoe to return in the other direction. 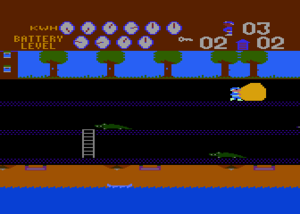 Alligators roam throughout the three dark levels of the sewer. If the Electrician runs into their mouth, he will die. If he jumps on top of their head, they will become stunned and remain motionless for a while. When an alligator passes through a wall, they leave behind a small glowing object. If you shine your flashlight on the small objects left behind by alligators, it will transform into one of two things. It will either become a purple orb which you can collect for bonus points, or it will turn into a crescent which will chase after the Electrician. You must dodge this crescent or you will lose one life. Eventually, you will come upon a house. If the number of the house shown at the top of the screen matches the number designated on your key, you can enter that house and begin the next level of the game. If not, you must continue moving on in search of the house which you have the key for. 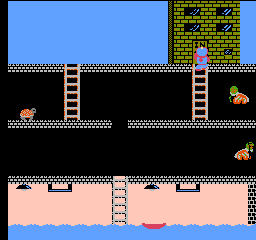 The changes to the sewer in the Famicom version are more drastic than the changes to the buildings. For one thing, there are only two dark levels, but the top outdoor level is traversable. Additionaly, the alligators are replaced with a larger cast of animals to avoid. The animals that you may encounter here are turtles, which can be jumped on (and off of) in order to stun them, a small monkey like creature which can drop down from a higher level to a lower level, but is defeated if the flashlight is shone on them, moths which you can duck under or they will kill you, and worms which hang from the ceiling of the water level. Different sewers between each building present a different outdoor landscape. There is usually (but not always) some place that you can jump beneath the landscape in order to effect some kind of change in the appearance and earn extra points. For example, if you jump under the police car next to the Statue of Liberty, the car will flip over and you will earn 3000 points. By changing the backgrounds in the sewer levels and sequentially beating the game several times you will unlock one alternative sewer level per playthrough, which will net you the real ending of the game after the 8th playthrough. Even though you can run along the top level, you will be blocked by the left wall of building that you encounter along the way. You may run into a man which runs to the left. If you do, he will leave behind a fist icon. If you collect it, you can punch your way through the walls of these building until the power-up runs out. 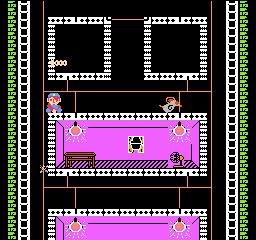 Since each sewer level in the Famicom version is only the length of the distance between two buildings, the buildings that you enter are always sequential, and you will never have to backtrack to the left to find the next building. This page was last edited on 7 May 2010, at 23:01.